Alice arrived on Monday 18th June 2012. Went to her new home on Saturday 8th September 2012. 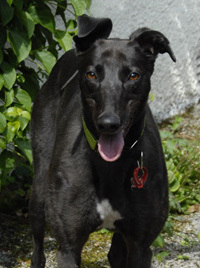 Alice is a beautiful black ex-racing greyhound who whilst with the branch has been fostered by Wendy and her family, Jenny and Stuart and their greyhounds and now Pauline and her family. We don't normally like moving the dogs from one fosterer to another, but due to circumstances we thought it best because of the other dogs coming in. Alice was born on the 14th November 2008. She is house trained, spayed, inoculated and microchipped. 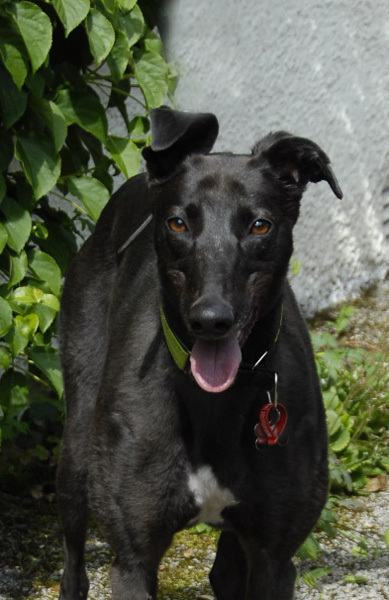 She has a lovely adorable nature, walks nicely on the lead once she gets to know the area, travels well in the car and is fine with other breeds of dogs and children. Alice arrived with Charlie this lunchtime and the two of them are like 'chalk and cheese'. Alice was wagging her tail, looking to the lady who brought her and thought life was wonderful while Charlie was more quiet and wary of all that was going on. Alice wanted to leave with the lady but easily side tracked she soon began to enjoy roaming around the garden and meeting our greyhounds, all of who had a good sniff and inspection, as dogs do! 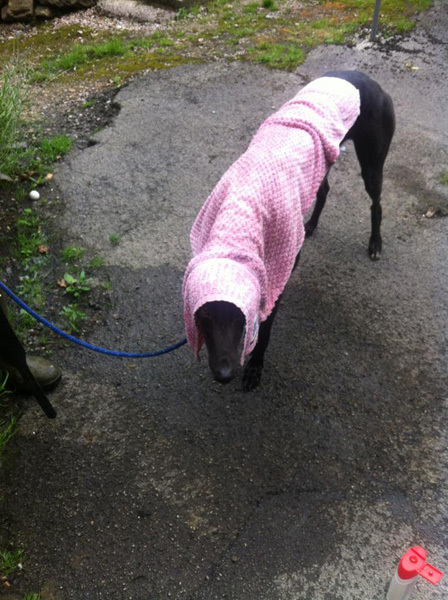 We heard from Wendy tonight who is fostering Alice saying she is doing really well after her trip to the vets. She's had a bit of supper and has done both toilets. Alice is quite bright considering and was exited to see Wendy when she got back in. Wendy says Alice is getting on grand. She's still a little wary of some people, but fine with others. She went to Wendy's Dad's for the first time and she just bounded through the door and went straight up to him tail wagging with excitement - her Dad is 6ft 4 and has quite a boomy voice. However, she still shys away from Wendy's boys, she's wondering if it's teenagers she's wary of not men, because she is also fine with Wendy's husband and their eldest son. 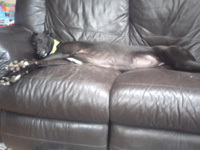 Alice loves snuggling up on the sofa with Wendy, and the closer she can get the better, she really is a loving dog. Alice is still eating her food outside but they are now in the porch, and once she gets used to that they are hoping she will eat her meals inside. It's one of Wendy's sons she is wary of more than any other, yet he bless him, really wants to become friends with her, and he doesn't understand why she is so wary of him. Alice who is being fostered with Wendy and her family went very, very quiet when she first went there and went into a shell. Whether she was missing Charlie, Rosie and Joey we don't know or whether the happy bouncy Alice that we had to begin with was all provado, maybe! Changing character so much was a concern and it was a great pity we couldn't send Charlie with her for company. Wendy hasn't been fostering long so to be given two new foster dogs on the same day and one as shy and nervous as Charlie would be a new experience for her and her family and not fair, hence Charlie stayed here with us. We heard today that Alice has just eaten her breakfast in the house for the first time, always prefering to eat it outdoors and away from Wendy's two greyhounds. She is slowly coming out of her shell, but still a bit anxious around new things, and we all believe she will be just fine. She really enjoys her walks, has met lots of other dogs and is absolutly fine with them. Wendy doesn't think she's ever had 'people food' before,and now Alice has discovered the delights of bacon, an instant friend maker! Wendy was telling me Alice gets better everyday. They had a lovely walk in their ' off the lead's place today. Alice and Coco, Wendy's greyhound, had a good run and a splashy water play, then on the way back they all thought it was a good idea to roll in a dead mole! Not funny even though it rhymes. Oh the joys! She does love balls and squeaky toys, and its a pleasure to watch her playing with these. This morning Alice went to the vet where she weighed in at 27k Following a check up she had her 1st inoculation and stayed in to be spayed. Alice is recovering nicely after being spayed. She is eating well and her stitches are nice and clean. Wendy's joiner came yesterday to start the floor in the kitchen and although Alice didn't go near him she wasn't bothered about him coming and going and making a noise. They were all as good as gold, until he went home then despite our best efforts all decided to walk on his wet concrete! When Wendy got home from work Alice was sprawled out on the sofa making herself vey much at home, all good signs she is settling down. Breakfast was eaten outside again this morning though because Wendy's son was pottering around the kitchen making breakfast, but as she says, they will get there. Wendy emailed to say her kitchen floor was down and looking good, the dogs were as good as gold. Alice is still a bit jumpy around her boys, but on Saturday afternoon when her eldest came home from work she was exited to see him and went right up yo him with her tail wagging, he was really chuffed! We received an email from Wendy this evening saying Alice is doing just fine with nothing new or funny to report. Wendy says Alice is still not happy with two of her sons, but is okay with everyone else she's met, and loves little dogs and pigs!! Since Alice went to be fostered with Pauline and Colin and all their greyhounds and whippets she's settled in well. This morning we received an email saying she had settled in well and is so good they don't even know she's there. 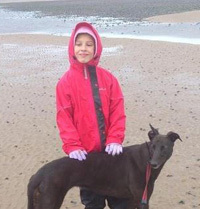 This morning a family who Pauline knows well called in to see Alice with a view to adopting her. 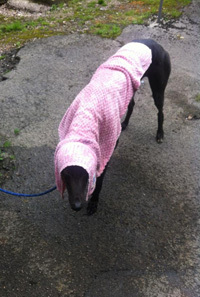 They took her for a walk and all got on so well they are wanting to adopt her tomorrow. 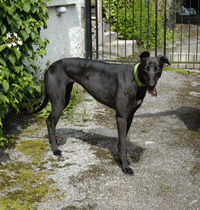 This morning Alice went of to her forever home where we hope she will have a long and happy life with her new family. Pauline received an email this morning letting us know that Alice was settling in well. At 5.30 this morning one of her new owner's got up and was about to go to work when he found his young daughter on the sofa with Alice. Both her and Alice were fast asleep - she'd crept down in the night to keep Alice company! 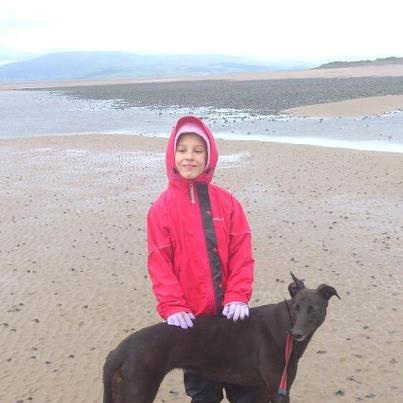 Alice's new owner says she's settled in really well, they could not have asked for a better dog. So well behaved, and her cheeky character comes out everyday. They love her to bits already. Alice's family now consists of a new baby and because of an unsettled atmosphere a friend of theirs who adopted Faun and Louis called in this evening and took Alice home with them to give the family a little time for adjustment. We heard this evening that Alice has settled in fine, but we knew this because she's stayed there before while her owners were on holiday so she knew the house and family. 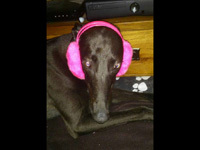 Dressed in her ear muffs!